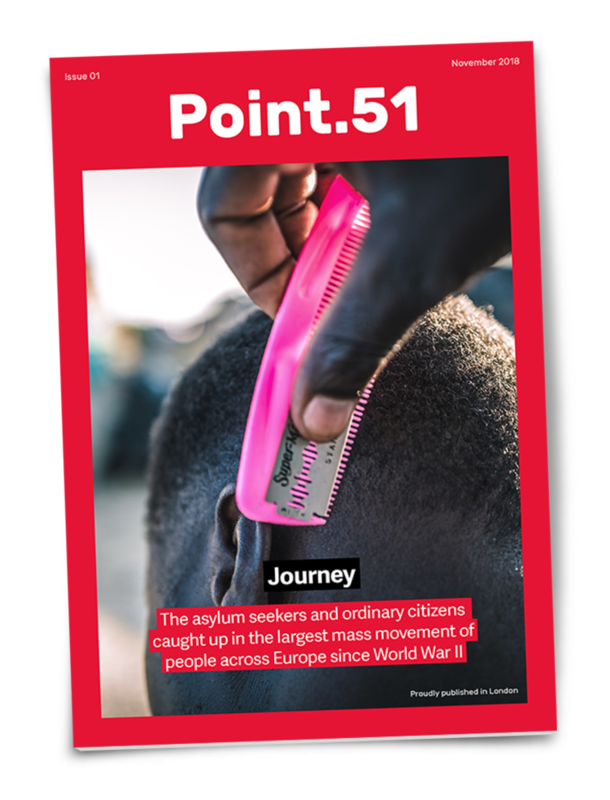 Calais is known to most people as the former home of the Calais “Jungle”. But now, more than two years since the camp was demolished, efforts are underway to rebrand the city and rebuild its troubled tourism industry – with little mention of migrants. But not everyone agrees that this is the best approach. 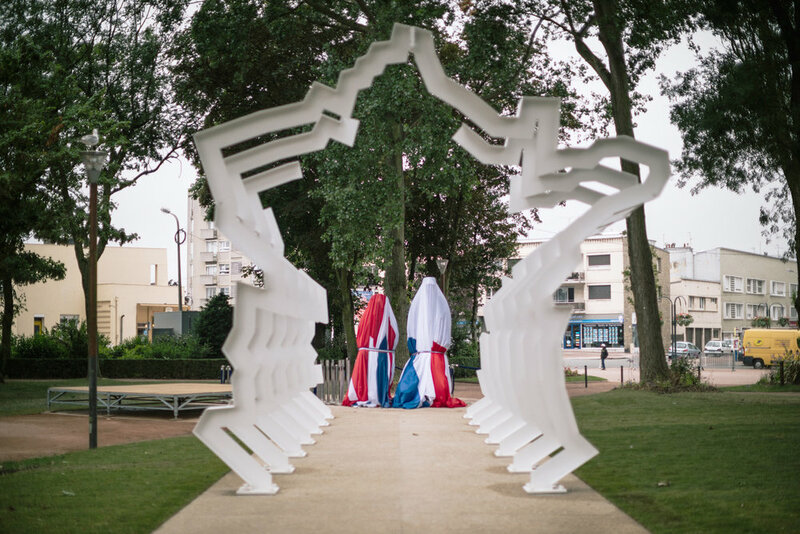 On a blustery day in June 2017 at the entrance to Parc Richelieu, two figures, separated by more than a foot in height, stand shrouded in the French Tricolour and British Union Jack flags. Roads have been closed, and occasional passers-by give in to curiosity and approach the two men. The rustling of leaves in the trees overhead is broken by the coarse twang of the tumbi riff in Panjabi MC’s “Mundian To Bach Ke” (“Beware of the Boys”) being carried on the breeze from a stereo in the white apartment block opposite. Crowds begin to gather, some sheltered beneath umbrellas. The national anthems of France and the United Kingdom are played and, to broken applause, the covers are pulled away, revealing statues of Charles de Gaulle and Winston Churchill – two wartime leaders often in opposition to one another, but united against Nazi Germany – stood side by side. In front of them, a gateway of white steel structures traces the contours of France. Within each structure, the northern border gradually recedes – sculptor Patrick Berthaud’s rendering of the mayor’s aspirations. But it could just as easily have been groups of Chinese tourists attending the statue unveiling that day. According to a local news report from October 2016, titled “A Statue of Mao in Calais?” City Hall had explored the possibility of commissioning a sculpture which showed a fictitious meeting between De Gaulle and Chairman Mao when De Gaulle formally recognised the People’s Republic of China in 1964. The city also reportedly considered a contract with a tour operator that would bring Chinese tourists to Calais. “It could be compensation for the crisis in our city,” the mayor is reported to have said. The idea was not pursued. As those that had gathered for the unveiling drift away, copies of one of the local newspapers are handed out free of charge. “All You Need is Calais” reads the headline in English. It is a day that City Hall has been building towards for some time. One thousand free day trips from Dover were offered in a prize draw as part of “Calais Celebrates Summer”, an effort to showcase what the city has to offer in a tentative first step towards rebuilding a troubled tourism industry. Coaches rolled on to early-morning ferries at Dover – the port city just across the English Channel, or La Manche (“The Sleeve”) as it is known in French – bringing the winners of the prize draw over for the day. But walking along the Rue Royale, one of the city’s main commercial streets, the slogan “All You Need is Calais” rings hollow. As light rain falls from a matte grey sky, scattered groups of British visitors – easy to spot with their “Discover Calais” baseball hats and “Welcome to Calais” tote bags – wander largely empty streets. Some shops are open and have laid on special discounts for the weekend’s visitors, but others are shut and have notices pasted on the windows that read “fermé définitivement” – definitively closed. At its northern end, the street opens out onto Place d’Armes where Union Jack flags hang from the awnings of the restaurants and bars that dot the edge of the square. But they are mostly filled with bemused Calaisians, unsure of what to make of the imitation red telephone boxes that have suddenly appeared on street corners and the scale model of Tower Bridge, made from bamboo and wicker, installed in the middle of the roundabout by City Hall. Revitalising the city’s troubled tourism industry will not be an easy task. Although not mentioned by the mayor – and noted only in passing by the British Ambassador, Ed Llewellyn, who commented on the improved “security situation” compared with the previous summer – in the minds of many potential visitors Calais has become known for one thing: the presence until October 2016 of Europe’s largest shanty town – the “Jungle” – and the daily attempts of its residents to reach the UK.